A deeper look at the grooves pressed into the Dreams From The Factory Floor LP by Louise Distras. The problem with a lot of what is earnestly being marketed as punk rock in the twenty-first century is that much of it is fundamentally flawed: it’s made the way it is because that’s what’s expected.The expectation is that punk songs will come equipped with a confrontational attitude stacked on top of a progression of between three and five chords, and somewhere in the mix there will be an easy-to-digest one-liner which can appear on a banner for impressionable youth to rally behind. That doesn’t mean it’s bad, just that it’s easy and that’s the problem â€“ unlike a lot of what appears now, the first wave of punk was most definitely not easy. Rather, the first wave of NYC bands (Ramones, Patti Smith, Talking Heads, Television, Blondie) were primarily concerned with just getting heard. They used the talent and tools at their disposal to make their vision real; they didn’t have a handbook or the money to be anything more than just themselves â€“ that was punk rock in a nutshell. While it took a bit of time in some sectors, eventually punk crossed over into the mainstream and got co-opted and formalized by the pop machine and, now, a lot of what arrives often feels like variations on a theme rather than infectious and exciting new music. Now in 2015, it feels frustratingly unusual for new artists to challenge the norm but, on Dreams From The Factory Floor, upstart Louise Distras challenges the status quoon every front and makes a real punk album in so doing. The basic ingredients which factor into each of the dozen songs on Dreams From The Factory Floor are all present as soon as â€œStand Strong Togetherâ€ kicks the door off its hinges and opens the record; lean guitars (both acoustic and electric) and spare, needs-first but powerful drums knock in and make an instant impression, but the real inimitable element is Distras’ husky, roughened-from-yelling voice which barks beautifully at listeners. 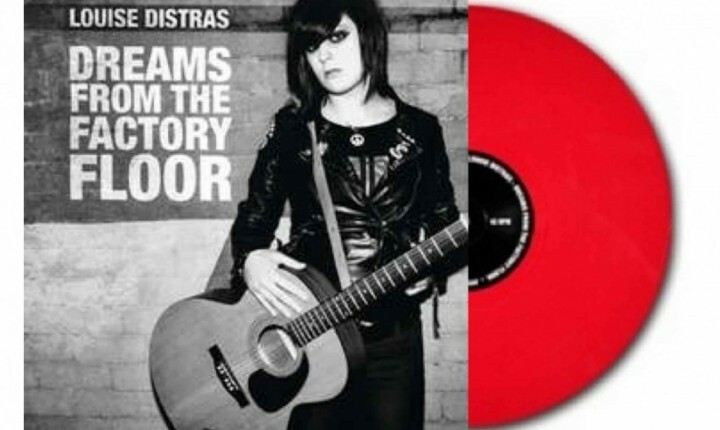 This is the real deal; in Distras’ voice lurks the raw power and caustic personality that Kathleen Hanna, Frank Turner, Joan Jett, Joe Strummer and Leadbelly all shared hins of but, because it’s so focused here, the results can make listeners weak and make them shudder. The singer’s London-bred voice is a brilliant tool â€“ when you hear lines like â€œThe music that brings us together/ Is the same thing that tears us apart/ Stand strong together/ With unity in your heart,â€ you’ll feel it in your guts and you’ll be hooked for the long haul through the album, guaranteed. The momentum set by the A-side of …Factory Floor continues to power the album’s B-side, but Distras does dig a little deeper into what feels like more personal and reflective areas as well. In â€œA Thousand Tears,â€ for example, the singer laments the one who got away while also cursing his cheating heart before getting darker (but not more dour, really) with â€œStory Is Overâ€ and just pouring her heart out for the tape recorder to pick up. It’s cathartic, sure, but it also gets haunting â€“ especially when Distras puts her guitar down and contemplates the desperation of factory town living in the spoken-word title track. Listeners will find that hardened tone sobering and unsettling for sure, but Distras redeems the running by picking up her guitar one more time to sing one more song of the unsung (â€œPeople Of The Abyssâ€) to close out the record.The way those last two songs relate with each other is absolutely superb and will leave listeners glowing after the experience, but they also stand as great bait for repeated listens right away; they may represent the end of the album, but listeners who go front-to-back with it will happily sink the needle back into the album’s A-side after the B-side runs out. That said and taking the Dreams From The Factory Floor LP as a whole, anyone who hears this album won’t need to be told that this music represents a rare breed, they’ll already know. This album flaunts the fact that it is different from the rest as one of its greatest traits, and it’s hard to disagree; on this hot pink LP lies another latest last chance for punk rock to really matter and redeem the weird kids that even mainstream punk rock doesn’t actually play to anymore. It’s exciting and hard and poetic and rough â€“ …Factory Floor is brilliant.